GDC The Ataribox has been renamed the AtariVCS, and it is finally here! Where? Suite 7088 of the Marriott Marquis hotel in San Francisco, USA, directly opposite this year's Games Developers Conference (GDC). There's only one problem: it doesn't work. And by "not work" we don't mean it crashed or is having teething troubles, we mean what we are shown literally does not work. 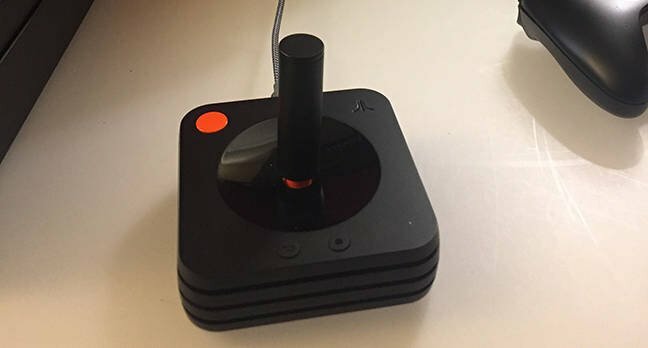 When Atari's chief operating officer Michael Arzt suggested we take a look at the ports in the back, we're surprised to find it actually weighs something: Atari knows how to mock up products. 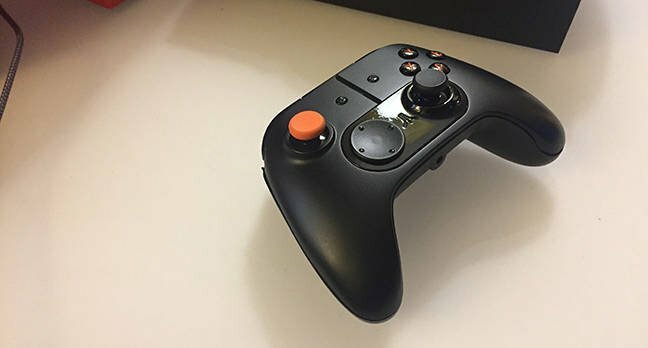 Less impressive is the accompanying game controller which looks like an industry-standard controller – the sort of thing you'd see hooked up to an Xbox or Playstation – but which is in reality a solid lump of plastic in the shape of a controller. The buttons don't move, the joysticks are rigid. It has nothing inside. "The traditional controller works," Arzt told us, pointing to the square-stick box with a red button that, many, many years ago, was the games controller. It's hard not to get a twinge of nostalgia. The red button goes down and when it does, a circle of red lights on the controller light up. The central stick moves. It appears to have a real USB connector. What happens if we plug this into our laptop, we ask Mike. I don't know, he says. Will it work? I don't know. If we plug it into a different games machine, will it work? No. So it's custom hardware and software? I don't know about that. Mike doesn't know lots of things about the AtariVCS – standing for Atari video computer system – which is odd because he's the exec in charge of it. But for those things he doesn't know, he makes up for with all the things he does know. None of which he can tell us about. Launch date? Can't say. Interface? Can't tell you. Hardware manufacturer? Can't tell you. Games developer partners? We're talking to people. Target market? We can't say. What makes this all the more amazing is that the Ataribox was supposed to launch in December before, literally on launch date, the company pulled it citing vague issues with components. It then went silent for three months. Mike tries to tell us that big product launches are suspended all the time. We tell him they really aren't, and on the rare occasion that they are, the company goes out of its way to explain why and give a new launch timeline. So far, Atari refuses to give even a preorder date. And it won't say what the issue was that caused the launch to be called off. Was it hardware? Software? They won't say but apparently it's been resolved. Yet there is still no working model. Mike explains that the situation is the hours before the final countdown to a NASA rocket launch. Sometimes, even in the last few seconds, they have to call it off because of one small issue. We point out that a games console is literally nothing like a rocket launch. It will be "like a good laptop"
We have to be honest, we tell Mike, as he explains that AMD has offered another chip that is faster and will cost around the same and so it might shift to that chip, it doesn't sound like Atari has the slightest idea what it's doing. Literally across the road, companies are live demoing headsets that track your eyeballs and respond accordingly. One area has people physically running around with sci-fi superguns, blowing things up as they appear in their vision and avoiding their fellow players who appear in the game in the correct physical space thanks to wireless tracking accurate to 0.2mm. Why are we in a hotel suite staring at a games console from our youth that doesn't even work? And the answer, and the only reason, is the name.